How would you like a chance to win a free vehicle? Of course you would love this, Enter the Hiring Our Heroes Toyota Sweepstakes now at Hiringourheroes.org/toyota-sweepstakes for your chance to win one current year Toyota vehicle valued at $40,915.00. 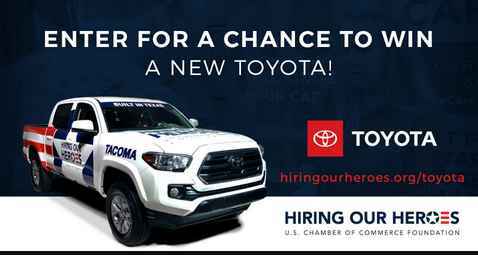 Visit this link:Hiringourheroes.org/toyota-sweepstakes to go to the sweepstakes page. One lucky winner will win one current year Toyota vehicle with a Manufacturer’s Suggested Retail Price (“MSRP”) of $40,915.00 or less (includes delivery, processing & handling fee of $955 and excludes taxes, title, license, and registration. Who Can Enter: This sweepstakes is open only to legal residents of the fifty (50) United States and serving or have served in the active duty who are eighteen (18) years old or older at the time of entry and have a valid driver’s license.